Beyond the Pebble Ridge. Focus on Northam Burrows Country Park. Northam Burrows Country Park lies at the mouth of the Taw Torridge Estuary and is protected from the raging Atlantic Ocean by a famous Pebble Ridge which runs the length of the two mile stretch of beach at Westward Ho! The Burrows consist of over 600 acres of coastal grassland, sand dunes and salt marsh known as The Skern. This area certainly appears to be a bleak, barren wasteland, but looks can be deceptive. It is a designated site of scientific interest and although there is a dearth of vegetation on the actual pebble ridge save the odd sprig of sea spurge, the Burrows supports a variety of plant life including Dune Pansy, Glasswort, Sea Holly, Sharp Rush and Storksbill. The saviour of the Sand Dunes is Marram Grass which grows vigorously in this inhospitable landscape. This common land is shared happily by all manner of tiny creatures, birds, butterflies, horses and sheep as well as golfers and walkers. The oldest links course in England is sited within the park and a separate section is set aside for local horse riding stables. All in all it is a splendid asset to the Bideford Bay area and is enjoyed come rain or shine by locals and visitors throughout the year. The Sand Dunes have become a haven for ground nesting birds, butterflies and wild life including common lizards, mice, snails and voles since they were fenced off to protect this delicate habitat from erosion. In addition to access from the Westward Ho!, an entrance via Pimpley Gate leads down a road, past the Royal North Devon Golf Club on the left, through the links and grassland to the car park at Sandymere. Access to the beach is via the massive stone steps which straddle the Pebble Ridge. An RNLI Lifeguard Hut is positioned on the ridge in summer months. The Visitors Centre is at the end of the road beside the Dunes. It is open to the public during the holiday season so if you are planning to walk around the Park ask for advice first, take a look at the exhibitions and enquire about guided walks, circular walks, birds, vegetation, history and geology. Reference books, cards and gifts are also on sale. I recommend the handy illustrated guide which has a Park map. 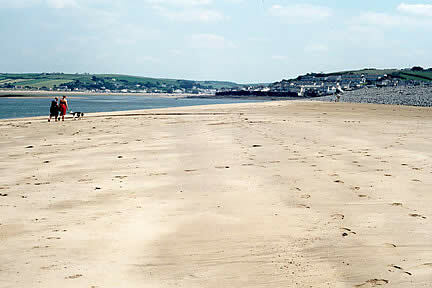 There is a trail between the Sand Dunes and the Golf Links which leads down to the estuary and around or an alternative access point to the Skern is via the gate at Burrows Lane on the Appledore Road. Birdwatchers enjoy coming here as the Skern (salt marsh) is teaming with life and attracts large numbers of birds including the Curlew, Dunlin, Ringed Plover, Godwit and the Oystercatcher. The embankment road winds down between grassland and the massive expanse of salt marsh where birds can be seen hovering above, swooping down, dipping their beaks in the mud or perching on the old twisted wooden stumps offshore. Meanwhile on the other side of the road horses and sheep graze silently together amongst the sharp rush. It is worth mentioning here that the residents of the Parish of Northam, known as potwallopers, have had the right to graze their animals on the Burrows for centuries. From this side of the Park there is a stunning panoramic view of Appledore, Northam, the Parish Church of St. Margaret's and Kipling Tors. You can stop on the grass verge or park at the end of the road. 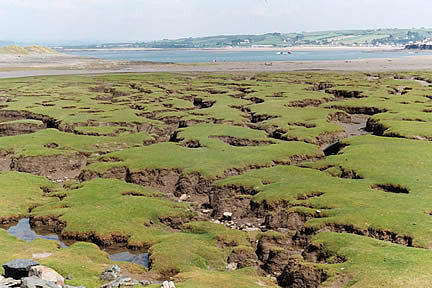 The salt marsh here is full of irregular deep grooves and has a bright green surface giving the impression of a giant jigsaw puzzle. Take a walk through the gate and follow the path to the estuary side of the Pebble Ridge and survey the vista from Grey Sand Hill. This is a very peaceful part of the Park and there is a good view of Appledore Lifeboat Slipway, the Taw Torridge Confluence and across to Braunton Burrows on the opposite bank. It looks a very picturesque beach but this is definitely not a safe bathing area and the tide comes in fast. At low tide DO NOT try and walk across the estuary or the Skern it is far too dangerous. There are educational guided walks during the summer months. The kiosks at the three entrancse to the Park are manned during the holiday season and there is a toll to use the Burrows at this time. 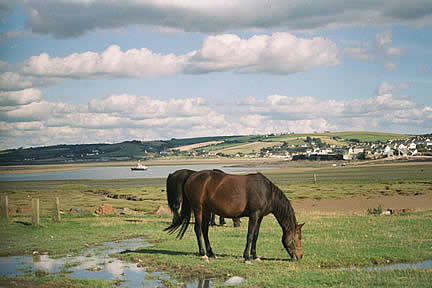 Braunton Burrows was awarded the UNESCO Biosphere status in November 2002, the first site in the UK to receive the international accolade.